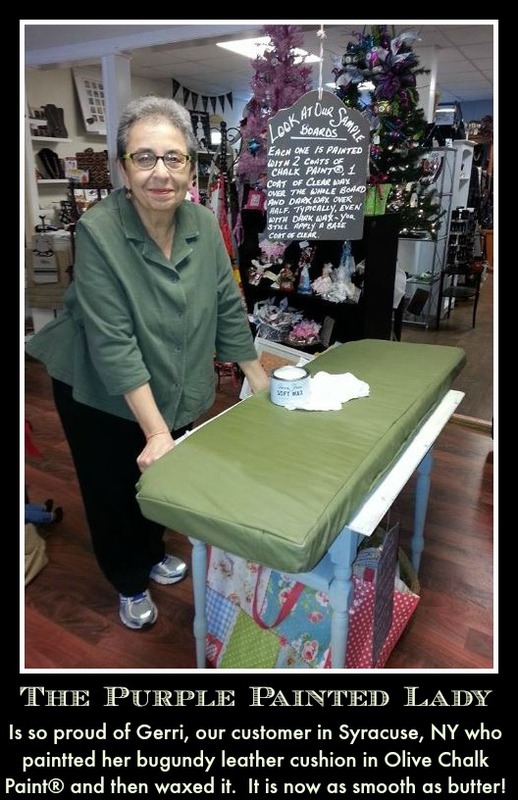 we are so proud of Gerri (shown in this photo) ~ one of our special customers in Syracuse, NY. She painted her burgundy leather cushion with Chalk Paint® decorative paint by Annie Sloan. Gerri painted a few thinned coats of the color Olive. 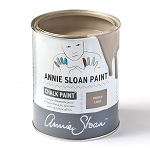 We recommend that you apply your first coat- and allow 24 hours of wait time before you paint another coat. 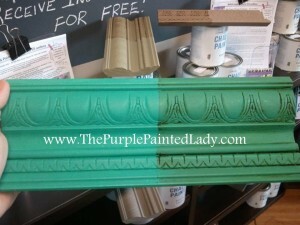 Then- after her last coat of Chalk Paint® dried, she sanded the paint softly with some 400 grit sandpaper. In this step- make sure to be careful not to sand the edges or corners. Again- stay away from the edges so you do not accidentally wear thru the paint. Once she polished the surface- the paint felt smooth and soft. Lastly- she visited me at the Baldwinsville shop, and I helped her finish it off with an application of Annie’s clear wax. Basically- we gently rubbed the wax around and in and then stopped when it felt smooth and almost dry to the touch. This was a super easy process and the wax sealed the paint and made it feel like the most luxurious leather coat you have ever felt. Have you painted anything leather? 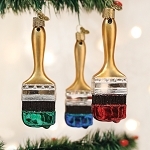 If yes- please post a photo on our Facebook page and one of you will be selected to WIN a free gift from The Purple Painted Lady on Monday, December 29th, 2014. 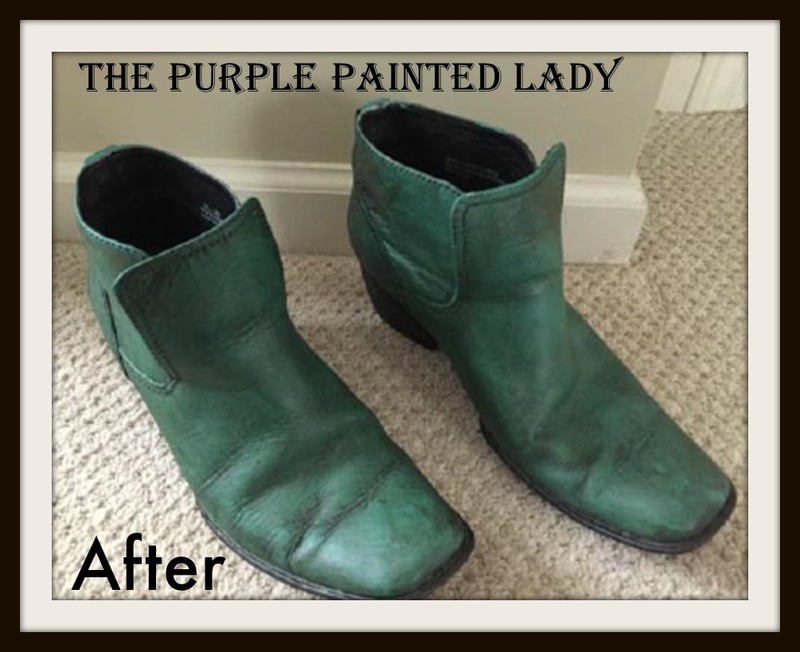 Paint your old leather boots with Chalk Paint® by Annie Sloan? 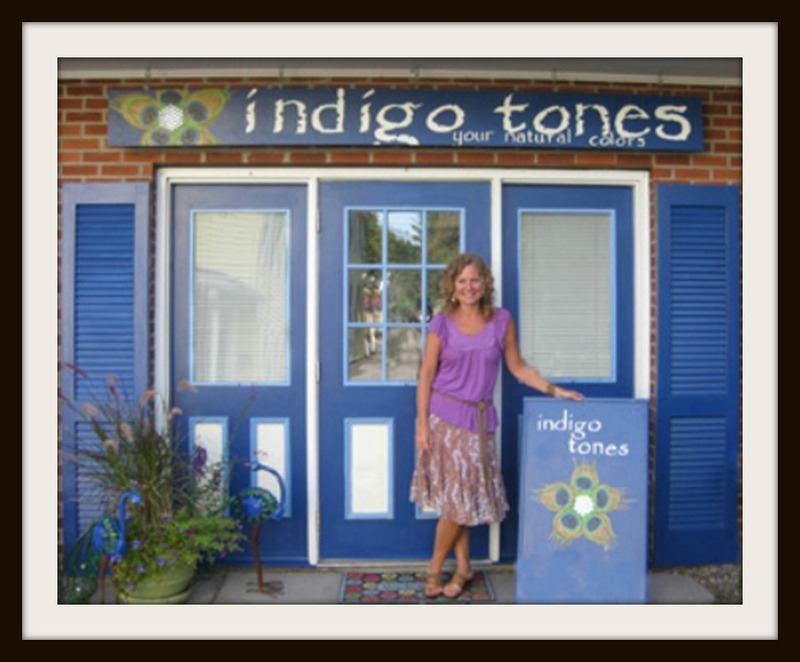 My friend Kerry Stich, is a Personal Color Analyst and owns a business called Indigo Tones located in Pittsford, New York. 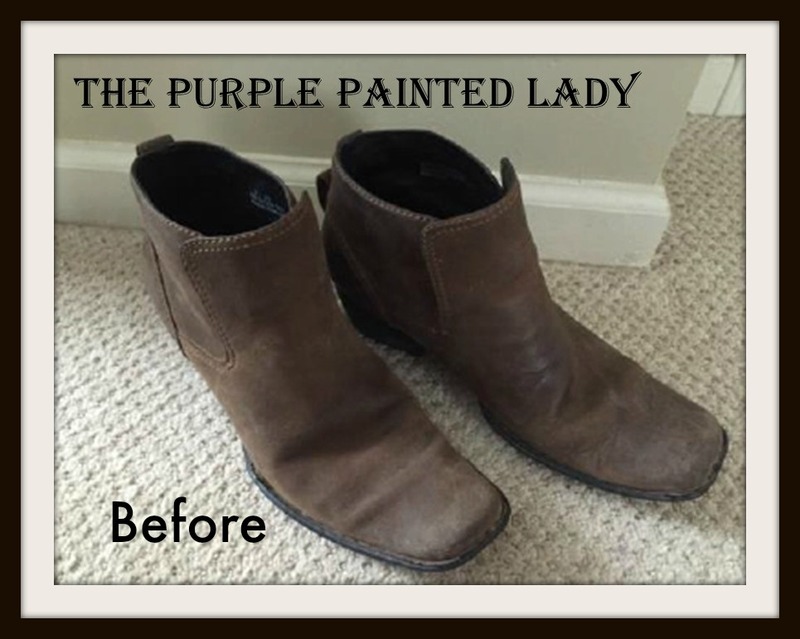 Kerry transformed her boots with Florence. Don’t they look awesome? Kerry says that the color Florence is the most universal color that looks wonderful on everyone! So, when shopping for clothes- look for Florence. To paint your leather boots, thin your Chalk Paint® decorative paint by Annie Sloan with a little water. Add about 10% to 20% water to the amount of paint needed for your boots. It won’t take much paint to paint your boots…maybe a couple tablespoons as most. Try “dry brushing” your first coat on initially and see the results. Do you like it? Yes? Great- apply a coat of wax over your boots. If no….go ahead and apply more paint. Either way- once done painting, apply a uniform coat of clear wax. It will moisturize your paint and protect your boots! Kerry’s specialty is doing individual color analysis. She will be a life saver for you since she guides you on which colors are best based on your skin and hair color. A color analysis consultation at Indigo Tones will give you the tools you need to build a wardrobe that compliments your coloring, your personality, your lifestyle, and budget. Kerry’s unique approach to personal color analysis will also help you understand more about who you are and what makes you feel confident. She provides the highest quality botanically based mineral cosmetics, organic skin care, natural fiber swatch books, and handmade jewelry and accessories. 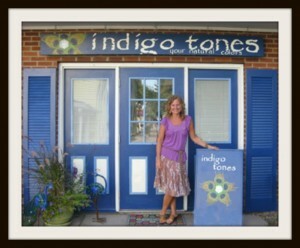 Indigo Tones is about finding the simple, natural ways we can make our lives better! Check out Kerry’s Facebook page HERE. 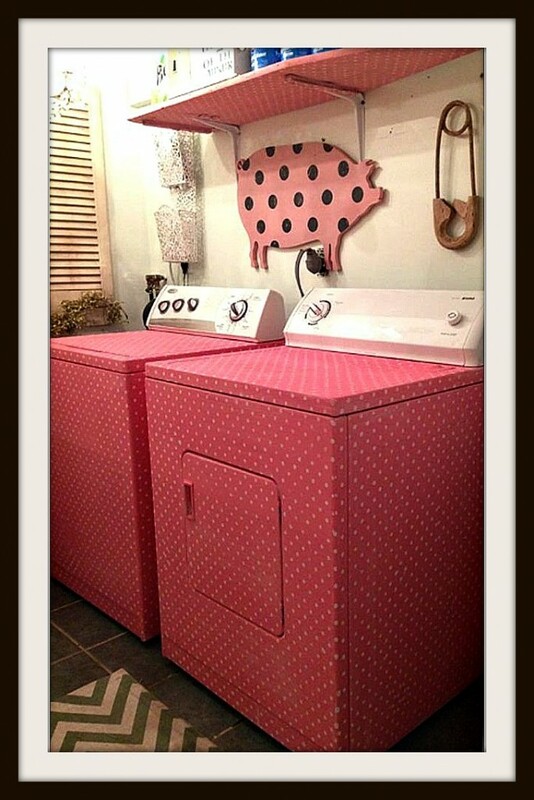 Use Chalk Paint® decorative paint by Annie Sloan to jazz up your old washer & dryer? Check out what Melissa’s Perfect Piece did! This almost makes doing laundry fun! My suggestion for painting your washer and dryer would be to wipe down each with water. Then paint with Chalk Paint®. Paint first coat and wait 24 hours, then do second coat. Adding detail? Do it with Chalk Paint®. Then, use the Artisan Enhancements Clear Finish as your top coat. It will work wonderfully. Looking for a site to order polka dot stencils from? Try Royal Design Studio! 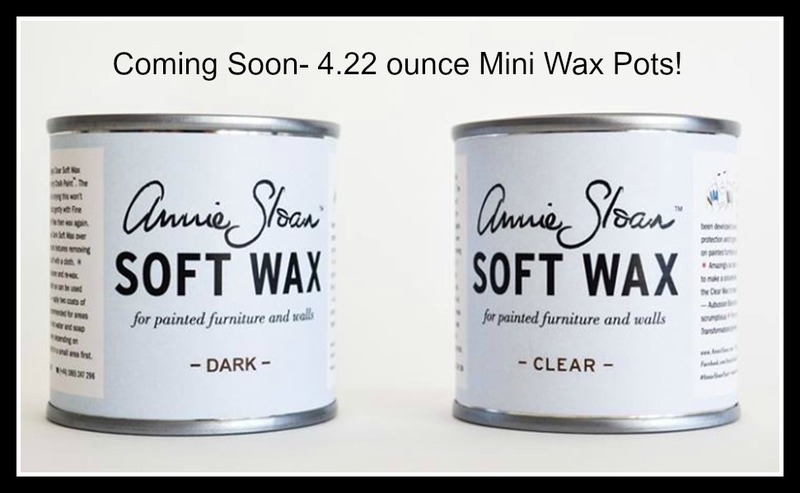 Mini Wax Pots by Annie Sloan?! Yes, in deed! And aren’t they beautiful! And they’re coming to The Purple Painted Lady on December 19th! Mini Wax Pots will be available in both Clear and Dark Wax. They are 4.22 ounces (about the same size as the sample pots of paint) and will be for sale at $15/pot! Perfect for those looking to test the waters using wax- or you just want a little dark wax. We are taking pre-orders, but note that your whole order will WAIT to ship together once the mini wax pots arrive! And just in time for the holidays too! Would you like to pre-order a mini wax pot -visit HERE!